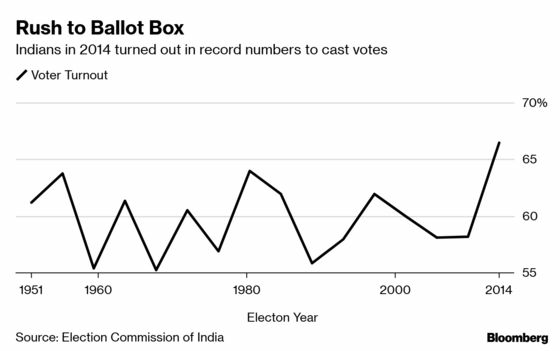 (Bloomberg) -- Indian voters trekked, drove tractors and stood in snaking queues to cast their ballots in the first phase of an expansive six-week general election, where voter turnout approached the record seen in the 2014 polls. The world’s biggest election, spread across seven phases, kicked off Thursday with more than 90 million people deciding the fate of 1,279 candidates, vying for about a sixth of India’s 543-seat lower house. The constituencies were spread across 18 states and two federally-controlled territories. The first phase of the electoral battle is expected to set the tone for the rest of the election, with the ruling Bharatiya Janata Party’s fortunes tested in the western belt of the crucial state of Uttar Pradesh. Prime Minister Narendra Modi’s BJP is fighting hard to repeat the clean-sweep it managed five years ago in this region and, across the country, to match its tally of 32 seats for this phase. The main opposition Congress is seeking to improve on its previous count of seven. According to the election commission’s initial estimates, about 66.2 percent of registered voters cast a vote on Thursday amid reports of disruptions including names struck off electoral rolls, clashes with security forces and glitches in electronic voting machines. The final numbers may show a higher turnout as voting continued into late evening. Apollo Hospitals Enterprise Ltd. Co-vice Chairperson Shobana Kamineni said in a video message Thursday that she had returned to India from a trip abroad to cast her ballot, only to find her name deleted from the rolls. “This is a crime against me as a citizen,” said the executive who runs India’s largest hospital chain along with her sisters. 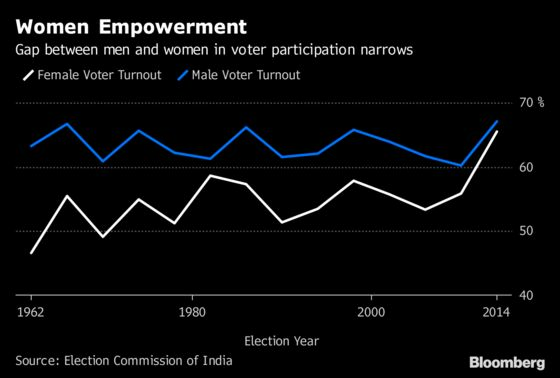 Indians turned out in record numbers in 2014, when the final count of 66.44 percent was a significant rise from the 58.21 percent recorded five years earlier. The 2014 election also created history with the highest-ever female voter turnout. Modi has framed his election message around issues of national security, while also pledging to boost farm income and spend $1.44 trillion on infrastructure to raise living standards and stimulate the economy. The Rahul Gandhi-led Congress party is trying to wrest power from Modi’s coalition by promising to rid India of poverty by 2030 through an income support program, waiving farm loans and creating jobs. The capability to execute has been the key difference between BJP and Congress governments, Garima Kapoor and Jatan Gogri of the Elara Capital wrote in a note. In terms of policies for social security and infrastructure growth, Modi’s government has a better score card than the previous Congress government. The Congress’s announcement of a large new $52 billion social-spending program risks creating fiscal problems and may require higher taxes, while the BJP has been more moderate in its poll promises, Mahesh Nandurkar and Abhinav Sinha, analysts at CLSA India Pvt., said in an investor note on April 8. Still, the risk of competitive populism after the elections cannot be ruled out and would depend on the strength of the election mandate. “The BJP government did not give opportunity to farmers to lead a respectable life. Enough of this government now,” Sharad Pawar, chief of the Nationalist Congress Party, said during a rally. “They fear that if Modi comes to power again, their shops of corruption, dynastic politics and venal defense deals will shut down," Modi said in a rally on the Congress-led opposition.